Pest control can be effected with chemical pesticides or by adopting a biological approach to garden pests. The climax vegetation of most town gardens is deciduous forest. Other plants require special management to survive, using physical and chemical techniques. It is the chemicals that are suspect from an environmental point of view. There are other ways. One alternative is to become knowledgeable about the natural history of garden pests. It is an absorbing subject and adds another layer of interest to gardens. Without this knowledge, flower borders may become killing fields for insects and small mammals. The infamous agent orange, which was once used to defoliate the jungles of Vietnam, was developed for agricultural and horticultural purposes. Many gardeners practise chemical warfare on a proportionately larger scale in their back gardens. Snails and aphids are a case in point. In the countryside, insecticides have make great inroads into the butterfly population. In gardens, insecticides kill the aphids' chief predator, ladybirds. Another way of controlling aphids is to encourage the ladybird population. If particular plants remain infested, possibly because ants are using them as aphid farms, one can resort to an old fashioned aphid-brush or a high-pressure hose. 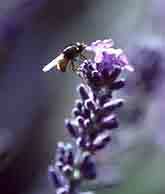 One must admit, however, that there are some plants and some pests which can be dealt with only by garden chemicals. The aim should be to limit pest control measures 'as much as possible'. Liquid Animal Repellants work by emitting an odour repellant to the target animal. Repellants are available for cats, dogs, birds, deer, rabbits, moles, mosquitos, rats, mice, snakes and squirrels. Ultrasonic Repellants work by emitting a noise which is inaudible to humans but repellant to the target species. Repellants are available for cats, dogs, deer, raccoons, skunks, and opossums. Electromagnetic Animal Repellants emit vibrations which are an irritation to animals. Ionic Animal Repellants work by producing negative ions which trick animals into thinking it is going to rain - so that they take shelter. Pesticides for pest control? Or chemical warfare?